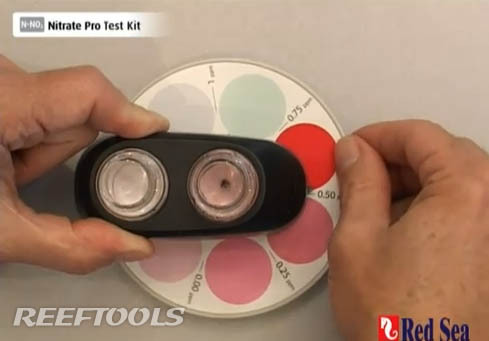 Red Sea has put out a video demonstrating the use of the Nitrate Pro Test Kit. The video takes you step by step through the setup and testing of a water sample. First you add the correct color-comparing disc to the cool record-player-like turntable. The process is quite simple, you begin by filling two vials with 16ml (each) of water. Then, taking one vial and adding 8 drops of Reagent A, shaking for 15 seconds, adding 5 drops of Reagent B, shaking for 15 seconds, and finally adding 5 drops of reagent C and shaking for 15 seconds. Now we wait for 9 minutes (Jeopardy theme playing). You than put the vials on the nifty little comparing device and begin to rotate the color disc until you get a match in color. That’s it. In the video, the result was somewhere between 0.75 and 0.50 so they assume you are at about 0.6. All done. Let us know if you’ve used this product and what you thought. Who's Got the Reef Munchies?